I had a lovely surprise going through my Delicious bookmarks a couple of weeks ago: I found a link I thought I’d lost forever! It was the link to a blog I used to love reading but couldn’t remember the name (my memory is no longer what it used to be, clearly). Their recipe for raspberry brownies was there, bookmarked a good three years ago. 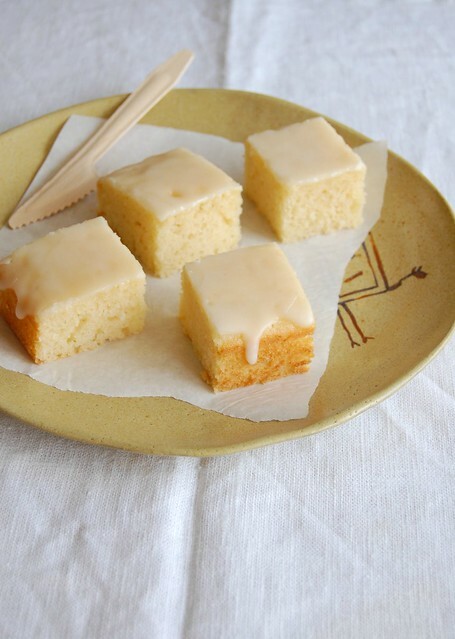 There were tons of delicious posts for me to catch up and the minute I saw this beautiful limoncello cake I knew exactly what I would bake for the weekend – the cake turned out really good, very tender and perfumed with the lemon liquor. The recipe is so easy you don’t even need an electric mixer to prepare it. Cake: preheat oven to 180°C/350°F. Butter a 20x30cm (8x12in) baking pan. In a large bowl whisk together the yogurt, eggs, canola oil, lemon zest and juice. Add vanilla, sugar and limoncello and mix well. Combine flour, baking powder, baking soda and salt and stir into the yogurt mixture. Do not over mix. Pour into prepared pan. Bake for 20-25 minutes or until golden and risen and a skewer inserted into centre of cake comes out clean. Cool completely in the pan over a wire rack. Glaze: sift the confectioners’ sugar into a small bowl and gradually add the lemon juice, mixing until you get a drizzable consistency. Pour over the cooled cake. Set aside for 20 minutes for glaze to set. Serves 20?!? Perfect for a party! Qué delicioso pastel, una receta maravillosa de la que tomo buena nota para probarla en mi cocina. Enhorabuena por tu magnífico blog, me apasiona!!! Beautiful, I love that perfect drip of glaze! Oh my gosh ...my mouth literally watered as soon as I saw the pic! Your cake looks and sounds totally delicious! Mary, you are far too kind, thank you!